A colleague shared a letter that she received from Senator Landrieu today in our Facebook Group, Major Moms. I was deeply disappointed to see the misinformed perception of this legislator. They were not in support of the Sanders Amendment, which would permit states’ individual rights to determine GMO labeling laws, because they believed labeling would be a burdensome cost to businesses, farmers, grocers, and food manufacturers. Furthermore, this Senator stated their belief that this labeling legislation is not based on science because the FDA, U.S. Department of Agriculture, and EPA have all deemed genetically engineered foods to be safe. Well, I’m certain you can understand how this got my blood boiling – within seconds of reading her posting! So, for those who may not know, I spent many years working in what is known as the identification industry – around 14 to be exact. I was a marketing manager working for a leading marking equipment manufacturer. Much of our strategy was focused on providing the maximum performance benefits for our customers at the lowest cost per “code.” This industry is full of manufacturers who focus on providing solutions centered around the identification and tracking of produced products throughout a wide range of industries – including food packaging. The sordid truth of this matter is that it would likely cost less than a penny to produce the necessary three character mark we’re all praying to see on the food sold in our country. I’ll break it down as simply as possible to make the issue of labeling cost crystal clear. Start looking at the products in your pantry and I’m certain you’ll find the identification marks I’m discussing here. How hard do you really think it would be to add three additional characters to indicate a product contains GMOs? We’re talking about a minuscule cost to implement! 1. 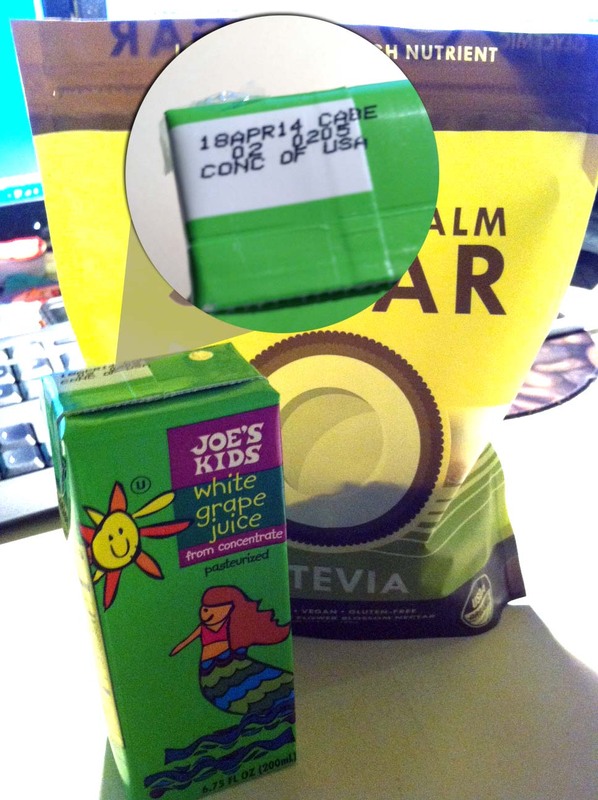 Most foods require some kind of batch, best buy, or expiration identification on each individual package sold. You’ll find this type of mark when you purchase nearly any perishable food – such as milk, eggs, or even beer. Because this tracking is required for consumer safety, most food manufacturers and packaging/distribution houses already possess the necessary inkjet printing equipment to print these codes. It’s even common today to find fruit packers making use of automated inkjet printing equipment for date and batch coding of produce. 2. Technically, the packaging design doesn’t need to change to accommodate the first wave of GMO labeling. It would be extremely simple to add just three characters, “G-M-O,” right with the existing batch/expiry/date coding on products containing GMO ingredients. These three characters, likely to be printed at a minimal size of 1/16″ in height would likely not add substantial or tangible costs for food producers, grocers, or farmers as is charged by Senator Landrieu. Literally, the equivalent of a single drop of ink could achieve thousands of “GMO” prints on product packages. I’m not sure about you, but I don’t really care about which ingredients, specifically, contain GMOs. If any food includes them, I don’t want to touch it. If food manufacturers were required to include three additional characters on their existing marking – this would not strain the system with undue burden. 3. Grocers don’t stand to experience any cost in legislative efforts to promote GMO labeling. Most food products will arrive on the truck with proper labeling in place. Additional products that need to be packaged within stores could accomplish the necessary objectives by simply modifying the basic information printed by simple label printers – like most of us encounter at a deli counter, meat department, or even throughout produce sections. There simply is no burden of cost for any of the concerned parties! The biggest burden is the fact that unpleasant truths will be revealed to consumers – and we’ll truly reach the tipping point of change that so many of us are working toward. In response to Senator Landrieu’s statement regarding our labeling movement not being based on science, I’d like to inform this lawmaker that the proof of safety rests on the very corporations that have been proven to conduct unethical business holding profits above people at every turn. Sure the FDA and EPA have approved GMO foods, but more and more studies reveal unbiased, independent research from around the world every day that condemns the consumption of these foods. More countries ban the import or growth of GMO crops as more damning evidence is revealed. I’d like to know how this loose regulation, its compass of substantial equivalence, and lack of proper safety testing offer any real science to U.S. citizens! I throw the statement regarding government’s efforts to remain based on science right back at this Senator. Sure it’s based on science – the science of manipulation and fraud. Despite any setbacks on the Sanders Amendment we’ll continue to fight and spread awareness. Learn more about how Moms and others that care are really making an impact – visit www.momsacrossamerica.com today! Thank you so much for the complement! I hope that this article helps many people to understand that the cost myth is not the problem that the biotech industry or biased legislators make it out to be. Integrating GMO labeling right into the expiration date or batch coding already required on packages nullifies any complaints regarding increased cost due to packaging design revisions, etc. People need to know that this is not a valid argument for pro-GMO food producers! I will keep sharing on this and other important issues…it’s nice to know that others are interested in knowing! Surprisingly revealing many thanks, I do think your readers may well want further blog posts such as this carry on the fantastic operate.